Nitric oxide and superoxide anion react very efficiently and inactivate each other as they form peroxynitrite. Thus, the bioactivity of nitric oxide depends, in part, on its interaction with superoxide. Increased levels of superoxide impair relaxation of cerebral arteries in response to endothelium-dependent stimuli. Kontos and Wei were the first to provide evidence that superoxide inactivates nitric oxide (EDRF) in vivo. Figure 2 Schematic representation of the interaction of nitric oxide (NO) and superoxide (O2-). NO is produced by eNOS and can diffuse to vascular muscle and activate soluble guanylate cyclase (sGC) resulting in vasorelaxation. NO can also rapidly react with superoxide to form pero-xynitrite (ONOO-). This interaction can occur in different cell type and subcellular compartments—wherever superoxide is produced. Superoxide can be formed within blood vessels by several sources including NAD(P)H oxidase, cyclooxygenase, xanthine oxidase, and mitochondria. 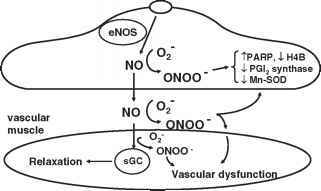 Once formed, ONOO- can produce vascular dysfunction through a variety of potential mechanisms (see text). NO-synthase), and activation of poly (ADP-ribose) syn-thetase (PARS). 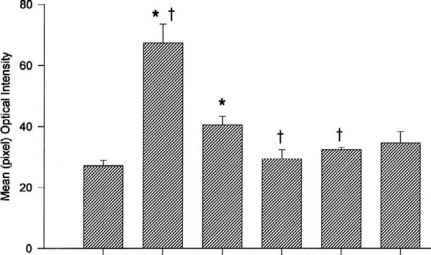 Superoxide may mediate impairment of endothelial function in the cerebral microcirculation in response to angiotensin II, b-amyloid peptide, or amyloid precursor protein (APP), alcohol, nicotine, and homocysteine, as well as in models of acute hypertension, traumatic brain injury, and ischemia. Endothelium, smooth muscle, and adventitia all have the potential to produce superoxide. There are multiple sources of superoxide, including NAD(P)H oxidase, xan-thine oxidase, cyclooxygenase, mitochondria, and NO-synthases, as well as autooxidation of substances such as hemoglobin, tetrahydrobiopterin, and b-amyloid. Thus, inactivation of nitric oxide by superoxide contributes to impaired endothelial and nitric oxide-mediated dilatation of cerebral blood vessels under several pathophysiological conditions.